Any agenda needs a method and an approach for reaching the goals and mission statements formulated in the agenda. If the mission statement here is to further develop this area of interactive architecture, then the method proposed in this book goes via the development of an architectural register for interaction. 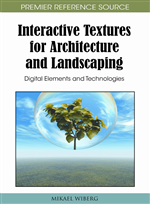 As formulated in this book we have, on the one hand, the traditional field of architecture which provides us with a rich register of concepts to describe and analyze our built environment. On the other hand, the field of interaction design enables us to do the same, but with a focus on digital technologies as the design material in focus, thus creating a knowledge gap in between interaction design and architecture which makes it hard to fully address this phenomenon of interactive architecture.